You’ve taken the first step to a healthier smile! 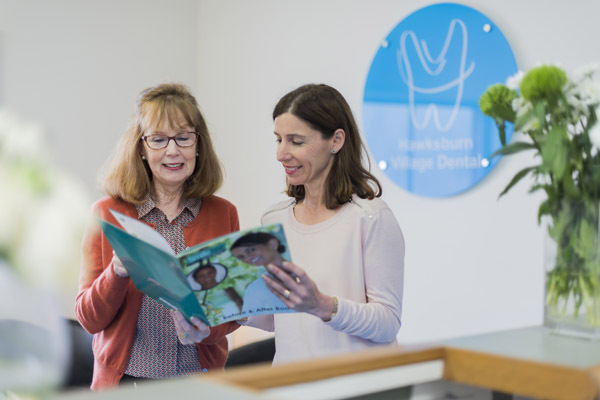 We’re glad that you’ve considered Hawksburn Village Dental as your choice when it comes to quality cosmetic, restorative, and family dentistry. Should you have any concerns about your teeth or require treatment, Dr. Pohl will discuss these with you. An itemized treatment plan will outline any steps necessary to help restore health and function to your smile. We invite patients to bring their iPods or other music player to help distract them during treatments if they are anxious about dental care. Our patients also have access to nitrous oxide gas and if required sedative medication can be arranged to help them relax through their treatment. Please bring your health insurance card with you to your appointment. Hawksburn Village Dental has an HICAPS machine available for filing claims on your insurance plan. We review all expenses with you prior to completing treatment, so that you’ll never be left with a bill that you’re not expecting. Hawksburn Village Dental does not engage in “Preferred Provider” arrangements. This is because we strongly believe that the process of clinical decision-making should be influenced only by what is in the best benefit of you the patient. Not by the vagaries of private health fund rules. Furthermore it is a basic right of any individual to see a dentist of their choosing – not to be limited to those dentists who have decided to align themselves with private health fund organisations. Finance for extensive treatment can be arranged via “DentiCare”. Please feel free to ask about this service.